The SupaChair Mini is a fantastic choice if you're looking to capitalise on unrivalled manoeuvrability in-and-around your home. Price excluding VAT.(Incl. VAT £2,154) *VAT Relief available on this product. The SupaChair Mini is a fantastic choice if you’re looking to capitalise on unrivalled manoeuvrability in-and-around your home. This powerchair has a turning circle within its own footprint which is essential when navigating around a small house or flat. Simply navigate around furniture, enter and exit bathrooms, bedrooms, and turn 360 degrees within a narrow hallway. The controls are extremely responsive, meaning you’ll get used to the joystick style control in no time. It’s the flexibility of this control which helps the SupaChair Mini glide around furniture and manage narrow hallways with ease. Another excellent feature is the simplicity. 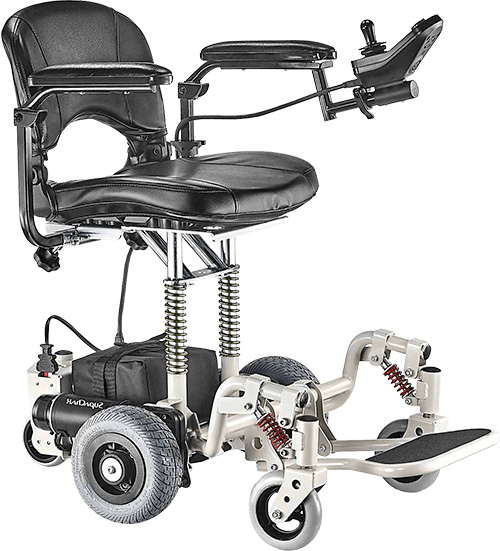 After a few moments with the powerchair, you'll be using it like a pro. It can run on either an SLA or Lithium battery, has a suspension seat for increased comfort, and can be used in conjunction with a car, plane, bus, or cruise ship. The SupaChair Mini has a weight capacity of up to 150 kg.